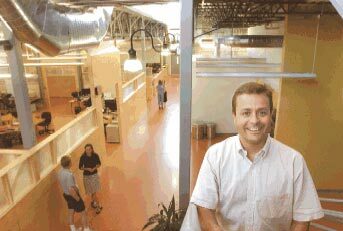 LIVINGSTON - PrintingForLess.com is Park County's fastest growing company, and it could get a lot bigger. Right now, 140 people work here, all of them earning wages that are well above average, plus a generous benefits package. It's already the biggest private employer in the county and another 20 people will be hired by the end of this year, President Andrew Field said. And even though workers are still dusting the construction dust off the company's new 64,000-square-foot building, expansion is already being contemplated. It's feasible that there could be 800 people working here at some point. That would put the company in a league with Burlington Northern Santa Fe Railroad, which employed 600 people here before it pulled out of town in 1986. Livingston struggled hard for years after that pullout. And while there are signs of economic vibrancy - real estate and construction are booming and tourism is doing well - the town lacks a large, stable core employer, such as Montana State University in Bozeman. And, if things fall into place, PrintingForLess.com could provide an anchor for major economic development here. It sits on a 20-acre parcel that is part of a 72-acre parcel at the westernmost Interstate 90 exit into Livingston. "We want to set an example of what can be done," Field said in a recent interview. He'd like to see his plant surrounded by similar facilities in a business park. "When one business expands and does well, it attracts others," said Tracey Jette, executive director of the Gallatin Development Corporation. "That's what we've seen in Bozeman. Success builds success." Jette and other economic development specialists compare PFL to successful, rapidly growing Gallatin County companies like RightNow Technologies and Bacterin, Inc. But in Park County, PFL is one of-a-kind. So far. It's clean, nonconsumptive and nonpolluting. Though the company doesn't release salary figures, officials say starting salaries are well above the Park County's average annual wage of $23,000, and even above Gallatin County's average wage of $27,000. The average age of employees is below 30, and at least 95 percent of the company's $23 million in projected revenue for this year is new money coming from someplace else. The work atmosphere definitely is casual. Attire ranges from sweats to shorts to jeans. Friendly dogs have the run of the building. Schedules are flexible, to a point. The view of the Absaroka Range is stunning, and there's even a company-run day care in the building, the first in the state. From the time they're hired, workers become part owners. Livingston City Commissioner Vicki Blakeman sees the possibilities. City officials last year annexed the property, even though it's 1.8 miles from the current city limits. That means PFL will pick up the bill for extending water and sewer services to its plant, even though it uses only a fraction of the pipeline capacity. "We felt it would encourage infill," Blakeman said. But the area is zoned in a way that will make it difficult for the area to become just another set of strip malls, "where you come in and come out." Blakeman worked at PFL for a while, and said she liked it. It provides young people a place to work without leaving the state, and it's a draw for other types of clean industries. PFL is only 10 years old. It started with six people, Field said, and has been booming ever since. He and his staff offered impressive statistics. The printing of everything from stickers to hardbound books is a $120 billion industry in the United States. PFL's niche - full color business cards, flyers, brochures and the like - is a $12 billion niche. Of that business, only 1 percent is done online, which is PFL's specialty. "There's huge potential," said Marketing Director Nick Runyan. Though the printing business is huge, no one company dominates it. "We think we might be that first national brand," Field said. The company has prospered by promising to do its job better, faster and cheaper than traditional printers, and it guarantees satisfaction. It employs impressive technology and advanced Internet skills, but also teaches people how to work together and be productive in a team. Each employee undergoes a 14-week paid training program. Workers in the production unit - the printers and press operators - can choose to work three or four days a week. People can advance quickly if they want to, said Runyan, and turnover is low, in part because employees are treated well. That means the company can find and retain good workers, almost all of which are college graduates. "I call them bright collar jobs," said Al Maurillo, who runs Job Service offices in Livingston and Bozeman. Those are jobs in which people do professional work in a relaxed atmosphere. "If people are happy, they're more productive," he said. And when companies offer significant numbers of well-paying jobs, it means other workers benefit. Maurillo said he used to get 50 applications whenever an opening arose among the 30 positions he supervises, which offer state wages and benefits. "Now I'm lucky to get 10 really good ones," he said. City government benefits as well. PFL's old offices - a former dairy in downtown Livingston - provided $15,000 in annual tax revenues. The new structure pays $90,000 yearly. Residential construction, on the other hand, consumes more services than it pays for. "Residential never pays for itself," Blakeman said. Field said he hopes someday to see former employees setting up businesses alongside his. Already, PFL has won statewide and national awards and attracted lots of national publicity. Success is infectious, said Gary Bloomer, director of client development at Tech Ranch in Bozeman, of which PFL is an affiliate. "It definitely builds success," he said. "It shows that high growth can be built in Montana. People say, 'if Andrew did it, why can't I?'" PrintingForLess.com will host a grand opening at its new plant on Friday June 30, beginning at 11 a.m. It will include forums on economic development in Montana and leadership development for growth, plus lunch.